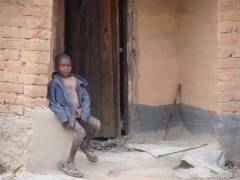 Charles Chibale Chola lives in the remote rural village of Kaishe. After observing the SCCP project that was developing in Samfya he went back to his area and talked to the church leaders. They formed an association to care for the vulnerable children in their community. There are six churches in six small villages covering about 5 kms of the road. They orginally discovered 193 orphans and registered them into the organisation. 2014 saw the last of the orphans in the programme complete Grade 12. The focus has now shifted to empowering the guardian families to be able to afford to provide for all children under their care. This is being supplemented by the Skills Training Centre (ZAM14c) with programmes run for preschoolers and extra lessons for children to have help with education. 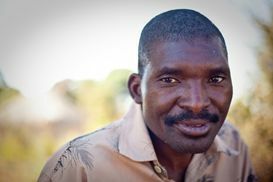 Charles has been working as an evangelist in this area for a number of years. As in many other areas, many orphans have come into the churches as members receive children from their extended families and as the number of orphans in the village increases. There was no infrastructure in the village communities to care for these children. 100 km up the road is the town of Samfya. In this town BHW partnered with a large orphan care programme called Samfya Community of Care Providers, funded from a large church in the USA. At the heart of this partnership was the coming together of churches from many denominations to make a joint effort to deal with the issue of orphans. This partnership has become a model for many other smaller communities. Charles saw what was happening there and decided to do something similar on a smaller scale in his area. Six churches have banded together to help. Kaishe is beside one the largest swamps in Africa so there is a lot of water borne illness. A small medical fund is also in place to provide basic medicine for the community. In 2007 a Skills Training Centre was built by the local community to assist with training the children who leave school (ZAM14c). 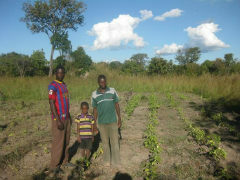 The training commenced in 2008 and currently runs extra lessons, farming training and a preschool. The orphans and vulnerable children in the Kaishe community, as well as their extended families and in fact the whole community benefits as more children are at school. There is a basic medical box available as well as the training at the Skills Training Centre. There are two great aspects of this partnership. Charles is a good man, we have known him for a long time and he is an agent of change. There is a good team of people leading this partnership from various churches. This underpins it with strength. Charles is an interesting man. When you turn up to his place it's tidy and clean. Every piece of his land is planted in something. He and his family are hard workers. Years ago Charles studied at Samfya Bible School and after graduation went into Christian ministry. He travels this area preaching and teaching. On many occasions he travels through into the DRC as the border is nearby. As he moved around the churches in the area he became aware of the issue of orphan care in the churches. There were too many children at Sunday School not going to school and not able to read or write. He therefore did something about it. He approached BHW after seeing what was going on in Samfya. He is a leader in the community, he is an agent of change and transformation. The vision is to care for the orphans and vulnerable children within a 10 km radius of the church Charles goes to. There has been pressure to extend this to 25 km but the numbers are overwhelming. The strategy is to get these children into school and for Charles to co-ordinate with the churches so that the children are attending church and receiving spiritual input. They are also seeking to empower the guardians through micro-loans and business and farming training to enable them to look after their own children. Kunda is 15 years old and would like to be a policeman. We visited Kunda at his grandmother's where he was staying in the holidays. This is his home where he lives with his father and step-mother, and another brother and sister. His father doesn’t work other than in the family field. The land in the field is not very fertile and they don’t get very good crops. The family struggles to support itself from the land. They grow mainly cassava. Not much relish is grown. They eat sometimes less than once per day. 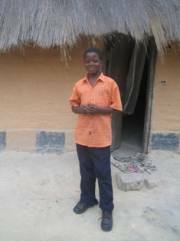 He enjoys going to school and wants to get a good education to ensure himself a better living in the future. He is able to read in both Bemba and English. He thinks the teachers at school are very good; they turn up every day. The school has no story books, and only a few text books; not enough to have one each. Most teachers would have a text book but there would be at least four students to a text book in the class-room. He goes to a youth group at the Church of Christ where they are taught lessons from the Bible and they do a lot of singing. Kunda really enjoys youth group. He has plenty of friends around his house. They like to read (his own school books), and play some football in their spare time. They help his parents around the home. They don’t get involved in fighting. • There is not much to do in Kaishe for young boys. There is nowhere to go and nothing to do. • Some of his friends are into smoking cigarettes. Interviewer’s comments: There were plenty of people around the interview area. The grandmother didn’t like being in Kaishe. She felt that there was a lot of “back biting”. There is a problem with the local land; it is very sandy and not fertile. Luimba is 19 years old and is in Grade 7. He attends the Kaishe Government School and there are 55 children in his class. His favourite subjects are English, maths and science and he enjoys playing football, volleyball and swimming. Luimba is a single orphan with one brother. He lives in a house with 20 people and his guardian does not have a job. They don't have a garden of their own but do take part in the community garden. They only eat once a day, in the evening, which leaves them hungry most of the time. Luimba likes to fish in the river and to help his guardian but says he gets bored. He would like to read at night but there is not enough light. Luimba seems healthy with no past health issues. When asked about health concerns he said he is concerned about malaria and there are too many mosquitos. He attends the Catholic church and enjoys hearing the choir and praying to God. He knows about HIV but not in detail. The church does not teach on this but the school does. When asked about any concerns Luimba mentioned the fact that he didn't have enough food, clothes or blankets for cold nights.